Special mechanism lets player switch between handbell and deskbell. Reduces the "double ringing" effect when playing melodies. 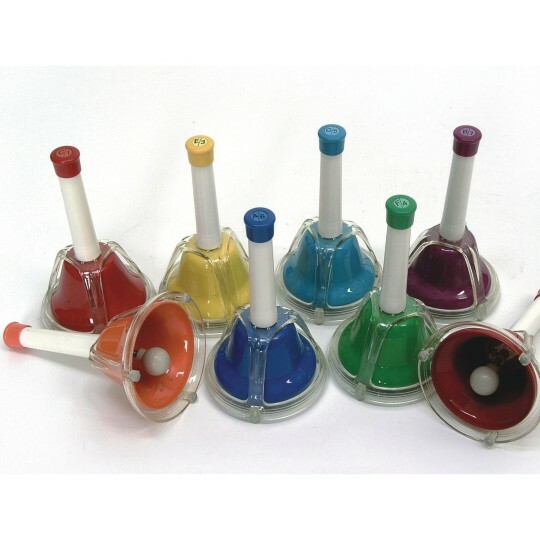 A special mechanism lets the player switch between handbell and deskbell with the touch of a button and reduces the "double ringing" effect when playing melodies. Set of 8. Ages 3+. I opened the box with my residents and within minutes we were playing. Of course there is a lot of room for improvement. I love the fact that seniors that have weaknesses can so use these bells. Because of the button those who couldn't pick up a bell can still feel accomplished. They also provide great sensory and coordination for the residents. Our resident enjoy ringing their bells for shows we put on at our nursing home.